Ontario Father Says Scientology Destroyed His Family; "We Didn’t Know What Was Going On"
Examining the roots and lingering grip of Scientology in Toronto. 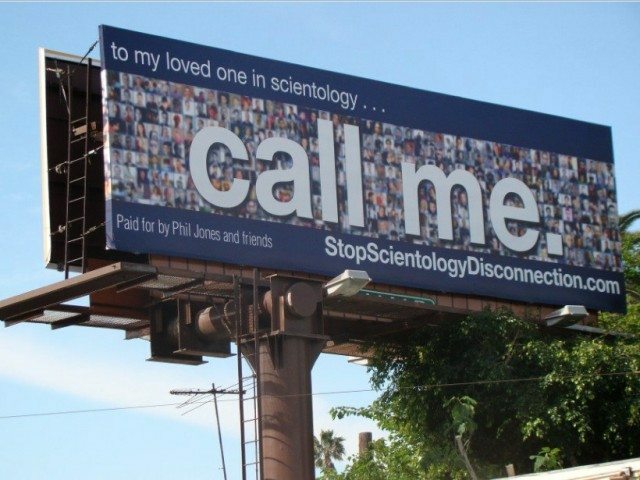 A billboard that was put up in Los Angeles, paid for by Phil and Willie Jones in hopes of reuniting with their children. The billboard is covered with pictures of Scientologists who have separated from their families. Photo courtesy of Phil Jones. Phil Jones hasn’t spoken to his son or daughter in four years. The Ajax native now lives in Nevada to be closer to his children, who live in California—even though they refuse to have a relationship with him. That’s because Jones—once a devoted parishioner at the Church of Scientology in Toronto—decided to leave the Church and speak out against its policies and abuses. “The thing is, if they were to get in contact with us—because we are what’s called ‘declared suppressive persons’ because we left and criticized—then they would be declared and lose friends, family, spouses. They would lose everything that they have. So that’s the threat that Scientology holds over their head,” said Jones. The Church of Scientology is the brainchild of science-fiction writer L. Ron Hubbard, who started the religion in the 1950s. The organization grew into an international network of chapters all around the world, including Toronto, which became extremely wealthy, and is no stranger to controversy. Followers pay to study “courses” and attend “auditing sessions,” which are described as similar to counselling. Over his “Scientology career,” Jones estimated that he spent around $150,000 on courses and services. There has been renewed focus on Scientology in recent years. Former staff members and parishioners have been coming forward, condemning the Church for abuse, forced abortions, and disconnection policies that have separated families. Phil and Willie Jones with their two children, Mike and Emily. Photo courtesy of Phil Jones. HBO’s Scientology and the Prison of Belief (based on the 2013 bestseller by Pulitzer Prize-winning Lawrence Wright), was released in 2015 and highlighted horrific stories of ex-members who detailed allegations of brainwashing, organized harassment, blackmail, and abuse. More recently, an A&E docu-series hosted by actress and former Scientologist Leah Remini was released last year. Leah Remini: Scientology and the Aftermath was nominated for an Emmy Award in July and its second season is set to air August 15. In Toronto, the local Scientology chapter made headlines in 2015 for owing the city more than $100,000 in property taxes and penalties for their building at 696 Yonge Street, reports a Toronto Star investigation. Revenue Services confirmed in May that the Church has since paid in full. The amount totalled more than $275,000 over the two and a half years. The Scientology building on Yonge Street, currently all boarded up. “We have not scheduled a completion date as yet. The parishioners are actively fundraising for the completion of the renovations,” an anonymous media spokesperson of the Church responded in an email. “All those people who donated all that money to renovate that building … now it’s just sitting there rotting,” said Jones. The current headquarters for the Church of Scientology is on College Street, in the Church and Wellesley area. There are around 1,000 parishioners located in Toronto, and 5,000 in Ontario, a Church spokesperson said. The most recent National Household Survey, which collected data on subjects like religion and gender in Canada, was released in 2011. The survey revealed there were 495 Scientologists in Ontario—and 1,745 in the entire country. A new National Household Survey with more recent numbers is expected in October, but those who have been following Scientology around the world believe the numbers are declining. Former member and co-host of Scientology and the Aftermath Mike Rinder disputes the Church spokesperson who claims that Toronto’s Ideal Org would serve 70,000 Scientologists across Canada. Rinder says the number of members worldwide is around 20,000. In 2016, he wrote a post on his blog explaining how he calculated the numbers. Jones was a teenager living in Ajax in the late 1960s when he went to a Scientology lecture after school. He remembers hearing about the state of being clear—“perfect memory, happiness, and all that.” But most of all, for the 16-year-old who wore glasses and had trouble speaking to girls, the idea that “clears” could achieve perfect vision and communicate better resonated with him. It was the moment Jones got recruited into the Church of Scientology, where he remained for the next 40 years. He said he remembers scraping up some cash to take a “training routine” course in Toronto over a weekend in 1970. Then, the Church was located on Avenue Road. He ended up meeting his wife through the Church and by the early 1980s, they had started a family. They lived in the Danforth area and their children went to a Scientology-run school on Blake Street. 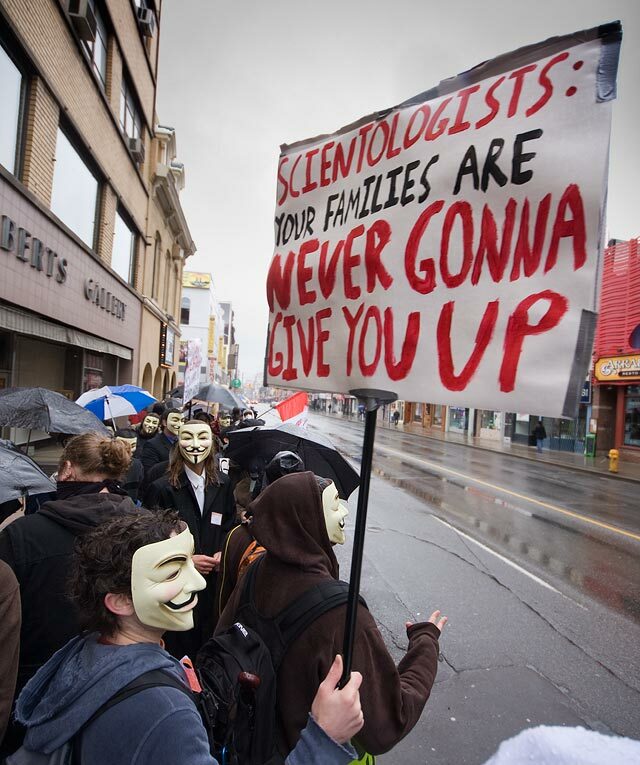 In 2008, activists occupied the sidewalks outside the Scientology building at 696 Yonge Street in protest of the “disconnection policy.” Torontoist file photo. 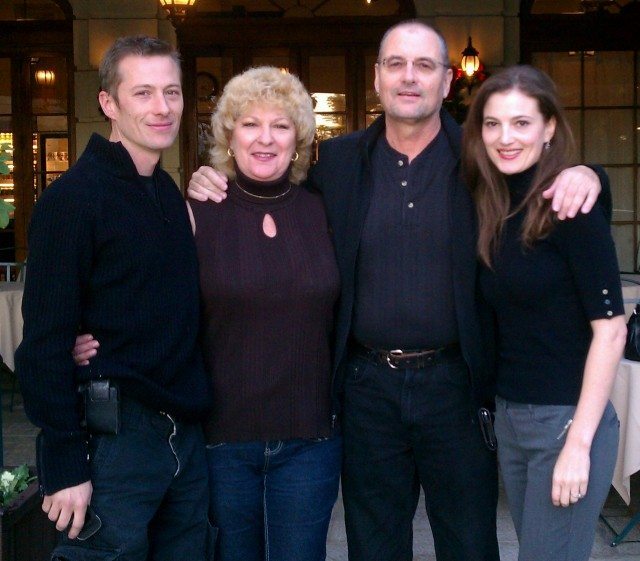 Around 2007, Jones and his wife left the Church “under the radar,” he said—a term used to describe leaving Scientology without telling family or friends, in an effort to not be declared a “suppressive person” (basically, an enemy of the Church). “We tried phoning. We tried showing up at the door. We tried everything. We put up missing posters for our kids. We had the police go and do welfare checks to see if they’re okay,” said Jones. He even put up a couple of billboards in California to bring Scientology’s disconnection policy to light. 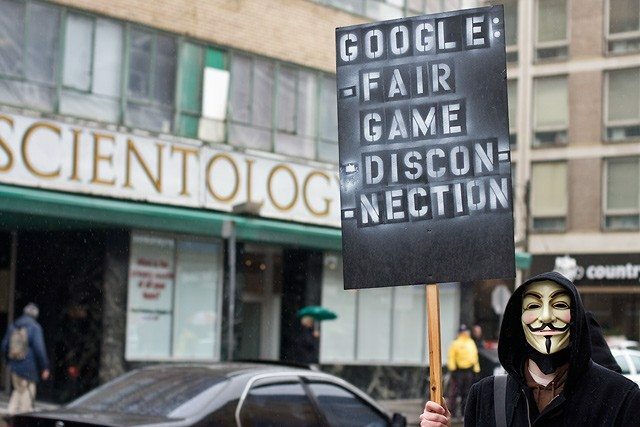 The disconnection policy is imposed on families who speak out or leave Scientology. Torontoist file photo. Jones said although the Church says disconnection is voluntary, Scientologists are reluctant to continue relationships with those deemed “suppressive” because they put their own relationships at risk. “We got out and that was it. That’s kind of when the disconnection all started and then it was like … my brother and my sister, nieces, nephews, our kids, all our friends,” said Jones. The Toronto Church was incorporated in 1967, more than a decade after the first Scientologists came to the city. The Globe and Mail covered Church activity in December 1968, when Scientologists refused to answer questions from a government committee. The Church maintained that the committee’s request for certain information was out of their jurisdiction. Two years later, the Committee on the Healing Arts accused Scientologists of libelous attacks against some of their members. But the committee did not find “sufficient reliable evidence that harm was being done to people in Ontario,” according to a 1970 article in the Globe. The Toronto Church was under fire again after their Yonge Street headquarters were raided by the Ontario Provincial Police in March 1983. The raid was part of an investigation into allegations of fraud and tax exemption claims, the OPP said at the time. More than 200,000 documents were seized and it was later revealed that 19 people were facing various charges in connection with the raid—including theft over $200, possession of stolen documents, and breach of trust. The Toronto Church itself faced 17 charges. Certain members were identified by police as working for the OPP, RCMP, as well as for the Ontario Ministry of the Attorney General. Documents from those offices, as well from the Canadian Mental Health Association, the College of Physicians and Surgeons of Ontario, Metro Police, and more, were discovered in the Toronto Church. Some members were convicted and the Church was fined $250,000 in 1992. Those involved were kicked out, said Ruby. “They cleaned house,” he added. Around the same time, the court ruled in favour of Casey Hill, who was a government lawyer, after he accused the Church of making libelous comments at a 1984 news conference. Hill’s $1.6-million award by the Ontario Court of Appeals was upheld—which was then the largest libel award in the country. The Church of Scientology is not registered as a charity in Canada, which means those who donate don’t receive an official donation receipt. According to the government’s online database, there are no public records to support that the Church was ever a charity in Canada—although a 1998 Globe and Mail article said that they had applied for charitable status around 1994 or 1995. (The decision to approve, revoke, or annul charitable statuses in the country falls upon the Canada Revenue Agency.) A senior analyst at the CRA was unable to deny or confirm any of the Church’s past or current applications. In 2014, lawyers at Toronto-based firm Blumberg Segal LLP published a list of Canadian non-profit organizations. Thirteen Church of Scientology locations in Ontario were included. The information was released after an access request under the Freedom of Information and Protection of Privacy Act, according to lawyer Mark Blumberg, following a year and a half of negotiations. In the mid-1970s, about a decade before the raid, Jones said he was asked by his fellow members of the Church to “break in” and “steal the files” from the CBC after an episode of The Fifth Estate focused on Scientology. “I refused. I’m glad I didn’t do it,” he said, because he’s pretty sure the person who did it was caught. “The thing in Scientology is that information is very compartmented. When you do find out stuff, it’s like, ‘Oh, all they did was steal some copy paper or something stupid thing.’ When you’re in Scientology and your head’s in it, you just believe whatever they tell you. That’s the mindset,” said Jones. Around eight years ago, Jones read a Tampa Bay Times article about “a lot of the abuses.” The article, part of a series, outlines stories of those who worked closely with Miscavige, who took over as Scientology’s leader after Hubbard died in 1986. Senior members like Rinder said they were verbally and physically assaulted by Miscavige, which prompted them to leave. One of the main reasons Jones is speaking out now, aside from trying to reach his children, is to make others aware of what’s still happening in Scientology. Groups like Narconon, which first attracted Jones to Scientology decades ago, are still active in Ontario. Narconon is a drug education and rehabilitation program based on the teachings of Hubbard and has been a registered charity in Canada since 1973. The Church denies its groups (like Narconon, Criminon, and Applied Scholastics) are used to recruit new members. In the meantime, Jones is awaiting the release of an eight-part docu-series he filmed with A&E. Although there is no release date yet, he said, it will feature hard-hitting, “on the ground” footage, rather than a talk-show format. “One of the things that finally triggered that last thing in my head for us to get out was reading the Tampa Bay Times truth rundown. That stuff is needed. People get out because they do read the truth. In Scientology, you don’t get the truth. You’re either lied to or protected from information entirely,” said Jones.